Adam Murray is not too despondent over Saturday’s first home League defeat by Barnet – but the Stags manager admits his side need to get some consistent home form going if they are to find success. 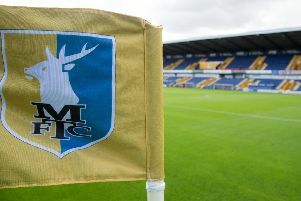 Stags, who play three of their next four games away, have not had a wonderful home record since returning to the Football League three years ago. “We’ve had a good start, but we need to get the hoodoo of this home form off our backs as, ultimately, that will decide whether we are going to be among the big teams up there this season,” said Murray. “Overall, from the fans to the players to the staff it’s like a little black mark at the minute. We’ve just got to keep trying to put it right. “It’s not like we’re turning up and going ‘we don ‘t care about it’. We care more than anything. We’ve got to try to tick that box as it’s a big step in our progress. “Let’s be honest, historically our home form is not great is it? That’s why it is constantly a big issue and it’s something you can’t really put your finger on. “It’s like on Saturday. People say we didn’t create opportunities. But we had 14 shots and 56 entries into the final third – that’s opportunities. I am not saying they are chances, I’m saying they are opportunities to make something happen. “We’ve got to be better than that. You can’t get in those areas that many times and not do something. I felt we should have had a goal. You can’t hide away from it. But we’re still in a very good place. “In terms of tactics, what do you do? We played with two centre forwards, two out-and-out wingers and we have gone and tried to attack them. He added: “It is disappointing but then you flip it on its head and say would people expect us to go to Leyton Orient and win. Would people expect us to go to Newport and win? Murray’s biggest problem right now is the never-ending flow of injuries. “I think we’re going to be a very good team,” he said. “The thing that’s killing us at the minute is again after 20 minutes you’ve got to change the whole thing, which threw us. “We need that consistency. Last year from the off we knew our shape, our team that was going to put the shirts on and the people that were going to fight for those shirts to get in the team. “Because of all the ups and downs at the minute we don’t know our shape, we don’t know what team we can put out. You can’t get into any rhythm or routine. Nothing is constant at the minute – and that doesn’t help. You are bitting and bobbing all the time. There were boos from the stands on Saturday at the end of the 1-0 defeat by Barnet, but Murray said: “I understood people’s reaction on Saturday because I felt the same. “When people were abusing me I wanted to scream back at them as I think we all felt we should have won on Saturday. So I have no qualms with that. We move on. “I am buoyant after the weekend. I had a bad day on Sunday, but it was spent studying and we aim to get better. “The eighth time of watching it I got a little bit more out of it. It was annoying. “I spoke to a lot of people over the weekend who were at the game and people whose opinions I respect and first half I think some of the play was really good. “We opened them up and we pulled them apart. So I think the passion from everybody in the ground after the game, including myself in the dressing room, and the players in the dressing room, was because we felt we should have won the game. Murray added: “There were a lot of good bits on Saturday but we can’t have games like that and not win. Fair play to Barnet. “Scott Shearer’s not had a save to make. I think he’s had two low crosses to come and collect and then pick the ball out the net which summed up the game. “One thing we missed on Saturday when we did get into that third was that ‘grrrr’. I felt we lacked that little bit of ‘let me out the cage and let me put something or somebody in the back of the net.